This molecule has “the potential to further improve the most successful principle of folate inhibition in the treatment” of Rheumatoid Arthritis. Folate antagonism has been the foundation of treatment for Rheumatoid Arthritis for almost two decades. Methotrexate is used to inhibit the proliferation of inflammatory cells, probably at least in part by folate antagonism. There are various theories of how methotrexate specifically inhibits Rheumatoid inflammatory activity. What if a folate antagonist could be made to target synovial inflammation without readily interacting with other sensitive types of cells? Could that increase effectiveness while reducing side effects? A German researcher reports in the current issue of Arthritis Research and Therapy on EC0746, a possible methotrexate alternative. EC0746 is constructed by connecting the anti-folate aminopterin (AMT) to a folate moiety using a “saccharo-amino acid peptide spacer and a hydrazide/disulfide linker.” The folate moiety binds to folate receptors (FRβ) which have a restricted distribution in RA patients limited to “activated monocytes and synovial macrophages,” key sources of inflammation and cytokine activity. If I were in the grocery store, I might say, “It looks like a chocolate-dipped banana. You can get the kid to eat the banana because of the chocolate that’s on one end.” So you end up with an anti-folate (aminopterin) similar to methotrexate that specifically targets the macrophages in synovial inflammation. In theory, it sounds good; and rats with induced-disease similar to RA showed improvement in joints and systemic disease symptoms. Why do we need a methotrexate alternative? 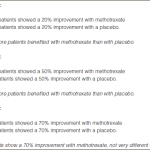 While methotrexate effectiveness was an obvious improvement over aspirin, a glimpse at the screenshot tells more of the story. Just look at the pain in those little red faces. 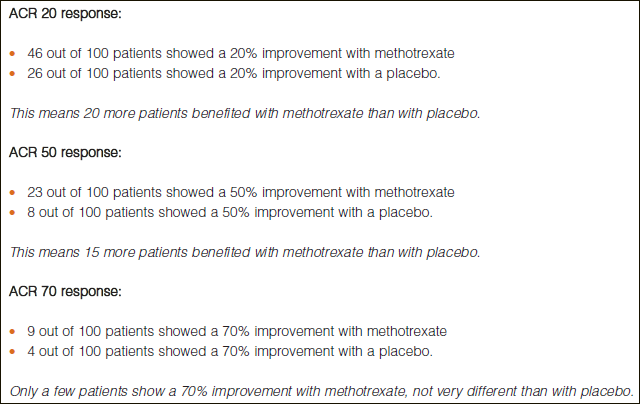 A broad review of methotrexate studies in the British Medical Journal and these images from a document on Evidence- based Rheumatology tell the story. 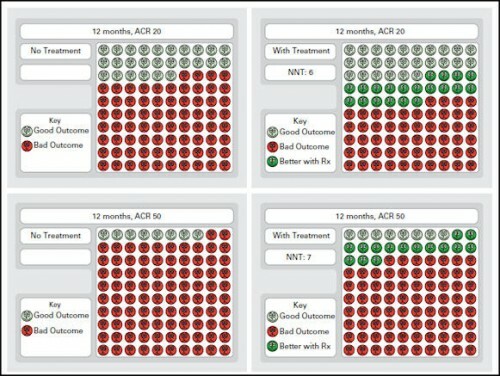 Only about a fourth of patients reached about 50 percent improvement (ACR50) from methotrexate therapy (click image on right to enlarge). In one study, about 7 out of 10 patients had little to no radiological progress in the disease over 2 years with methotrexate. Claims of effectiveness vary, but better treatments are clearly needed. I’ve looked at this older piece before and it looks like it was created as a tool to help convince patients that trying methotrexate makes sense: that most patients do all right as far as side effects and many have symptoms improved and probably a majority have fewer bone erosions. It also convinces me we need more options. 2) Patients need long term therapies that are less toxic than methotrexate. Even though methotrexate has been shown to be safer than other disease modifying drugs in many cases, some have difficulty accepting therapy that makes their difficult life with RA even more troublesome. This is true in spite of evidence that methotrexate could help protect the cardiovascular system from Rheumatoid disease activity. 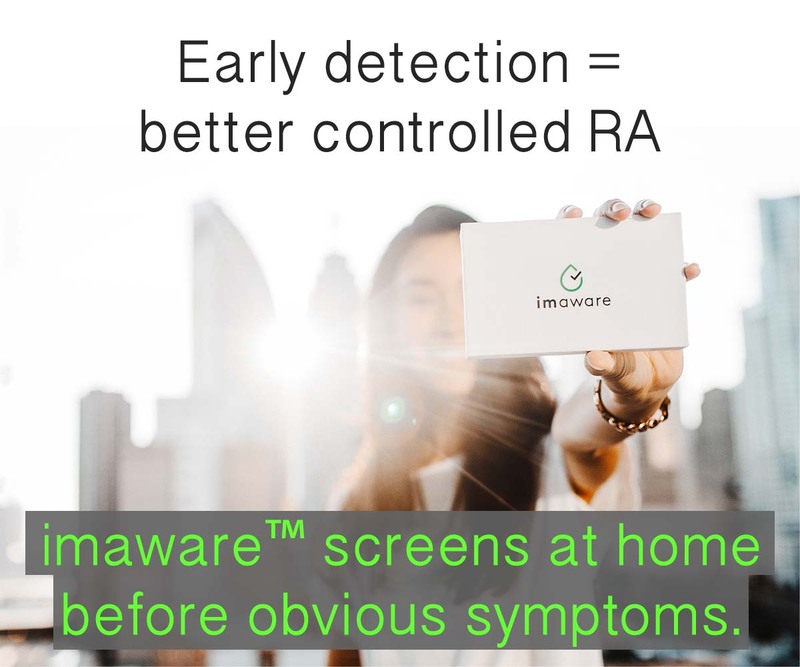 And although severe side effects may be rare, the specter of side effects looms for patients who must weigh long term risks since RA treatment continues over a lifetime. Edit 9/22/13: BMJ link had been removed, so replaced with something that works today, a link to a Google book search. Arava (leflunomide) was originally supposed to be a methotrexate alternative with fewer side effects until studies found liver toxicity rates were even higher than mtx and it takes several years to clear the body without special therapies. While some of us who cannot tolerate mtx are willing to take this risk, it will not be a first line replacement. I am excited about another alternative but would want many safety studies before I’d be willing to try it. that’s a funny thing about Arava and the other dmards, Chel. Some make the decision based upon the reputation of mtx as a cancer drug, assuming the others are safer. Docs may say that mtx is the safer effective option for RA, especially long term, but somehow the dangers of the others aren’t as publicized. We do need a good alternative to MTX. So many people get sicker from this med than their RA. It has worked for me, but how many cannot take this med. It looks like we have @5-10 more years before we the targeted med, so our gold standard will have to do! I agree that mtx has been a godsend to many. I’ve personally continued to take it (even though it doesn’t seem to help my RA symptoms much) becuase research seems to come down on the side of it as beneficial. But some cannot overcome side effects as you point out. What other medications do you take in conjunction with mtx? I’ve ran through a slew of TNF inhibitors. Those help for a short period and I move on to the next, then the next. Currently, Im on Rituxan and methotrexate. This seems to be the best so far.Im Chris as to others experiences of anyone has with Rituxan. What other medications do you take in conjunction with mtx? I’ve ran through a slew of TNF inhibitors. Those help for a short period and I move on to the next, then the next. Currently, Im on Rituxan and methotrexate. This seems to be the best so far.Im curiouss as to others experiences if anyone has with Rituxan. This alternative would help thoe that for various health related issues due to side effects of both mtx and arava would a option that hopefully would halt the further destruction to our joints and organs. Its good to see the research taking place. Keep up the good work Kelly. I have already failed both Methotrexate and Arava. Methotrexate caused me psychosis. I can’t find a single person who has had that side effect but I will never go through that again! I literally thought the devil was around every corner. Arava caused me low white cell count and diarrhea. I have failed others as well so my options are limited. Hope we get some positive research down the road. I stopped taking methotrexate over two years ago – I discovered that mangosteen helped me much more and it’s toxin free. I’m just now coming out of 5 days of misery. Don’t know if that misery was caused by the methotrexate injection on Thursday evening or by overdoing when cleaning up after my service dog’s messes from eating a huge amount of something she shouldn’t have (Hubby can’t deal with puke of any kind). So, either I strained my back and had gastric and muscle aches consequences of the pain and nerve pinching from that, or I had gastric and muscle aches consequences of my MTX injection. Whichever, I hope never to have this again, but don’t know if that wish is realistic as I do react to my MTX from time to time. Taking all these toxic drugs is miserable. I wish I didn’t have to take them, yet dread the weeks I’ll have to go without them when I have surgery next month. An alternative to MTX would be most welcome! After pushing to go on mtx (my rheum was nervous due to already elevated liver enzymes), I had to stop taking it after only a couple of months due to side effects. It gave me vertigo. I felt like I was on a boat….in choppy water…..ALL THE TIME..not just after I took it, but all week long until the next dose. I was afraid to drive and even had trouble sleeping. I hated having to stop because I thought it was finally beginning to help, but I couldn’t drive myself to work. Within a few days of not taking my next scheduled dose, I felt much much better. I still get vertigo twinges now and again (even after being off of mtx for almost 2 months), but it is really only at night when I am very tired and only lasts a few minutes. Hi everyone. My name is Patricia and I am 62 and from NZ- In January 5 years ago I was diagnosed with Palindromic Rheumatism. My Doctor is also a herbalist and by changing my diet and taking antiflammatory prescribed herbs I slowly improved- always needing to be aware that that PR was there though! Last year we had 3 Family funerals, one of these was my Sister who was only 63. (I looked after her for 3 months before she died) My body seemed to get out of balance and I started getting very sore feet…by Febuary I was diagnosed with RA…anything I tried only helped a bit..it was like the RA was coming to get me and take over and do what it wanted to do…after a long 5 months of pain, Doc appointments and advice from my Doctor and Rheumatologist nothing was working. This was until we went on Holiday to the Gold coast and my family over there were very loving and understanding and I ate strickly, rested, slept sat in the sun and relaxed and relaxed- no pressures at all for 17 days. I slowly started getting better..I am now on prescribed herbs, 5mg prednisone, 400 nurofen and supplements. I can walk without limping and close my hands- even though they still have a few nodules.I am working again, going out occasionally, have all day energy, and that all over body pain has gone. BUT the Rheumatologist wants me to go on Metotrexate- he says damage could still be occuring- I do not want to as I am so very sensitive to medications and do not want to have any side effects. Especially after being so very sick – any ideas? Thanks for listening! I know it’s possible, Tricia, but I’d look be sure there’s not another culprit. I do get some intestinal symptoms that might be the mtx even with a shot. Kelly …. hoping you can give me some advise. I have been in remission with medication for 2 years now … absolutely no pain what so ever. I take 20 mg of methotrexate once a week, 2 folic acid a day, and 10 mg luecovorine 24 hour after I take my methotrexate. I continue to experience hair loss. Dont want to sound vain, but I hate it. I am about to approach my doctor with regards to taking another medication. Do you think sulfasalazine would be a viable option? Or should I ask about lowering the methotrexate? The hair loss is really, really bothering so I have to do something. Appreciate your advise. Patty, Think very carefully about any medication changes! If you are doing well on your current combination of drugs, don’t make radical changes. You don’t want to mess up your remission! Hair loss can be caused by any number of things, not just the MTX. Like Kelly said, get a referral to a really good internist and an endocrinologist. Rule out everything else in the world, just keep your remission. My response to my vastly thinning hair was to get it cut really, really short and to wear scarves in any number of interesting ways. Not all of us women can make that decision. It’s really, really hard. But I’d want to keep my remission and to heck with my hair or anything else! I’m so happy you have a remission! I’m happy that you no longer have the swelling and pain. That’s what I’m hoping for, some day. We do need better drugs. Myself and RAD friends have suffered and nearly died on some of them. When will the ‘new’ methotrexate be available. Some new from Arthritis Research UK a new IV Protein BiP has promise in putting RAD into remission for months at a time. Patients need effective therapies that are less toxic than MTX for sure. That says it all. A methotrexate without all the side effects would be fantastic. Lets hope + pray the Germans keep going on the research to make it available. I was on Orencia and Plaquenil they didn’t work. Now I’m on Enbrel and Plaquenil and I’m having break throughs. I don’t want to take Methotrexate whats next? I was diagnosed in 2011. I have been treated with oral MTX and prednisone. Eventually Enbrel was added. I became very ill with an upper respiratory infection (requiring visits to the ED) and chose to stop the Enbrel. I was switched to injectable MTX (I do my own injections) and last year began plaquenil. The change I see with plaquenil is the decrease in fatigue. Because I wanted off prednisone my doctor suggested I add sulfasalazine (I could not tolerate it due to the GI effects). My doctor is recommending Orencia. Of course I am nervous starting another drug. Wondering if any one who has used Orencia might be willing to share about this drug? I am disheartened at the frequent treatment plan changes I am reading about on this site. 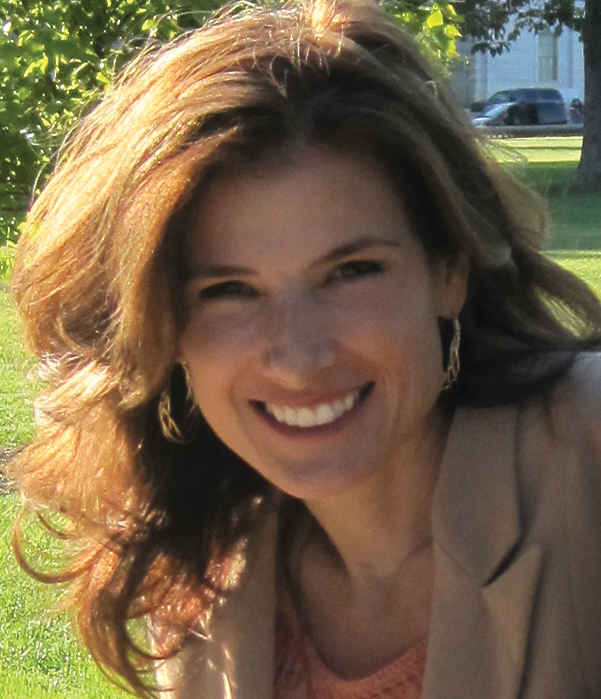 Kelly thank you for advocating for treatments that have fewer side effects and that are actually effective in treating RA. Also it is mentioned in some onset stories. You can always search a word or phrase in the search box on this site to find something. I do it all the time to answer questions. 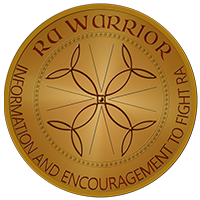 I was diagnosed with RA close to a year ago. Was put on 12.5 mg /w methotrexate, azapress 100 mg /day and pentoxyfilline 1000 mg /day. At first, it all helped, then hell broke loose. From mood swings to stomach problems you name it. I am not close to specialists, thus had to deal with it all. The doctors kept telling me it is me that is the problem. Not taking medication regularly as i COMPLAINED about the symptoms. Now that I start to read up on methotrexate, I realize which is/was the cuplprit, but what now. Where from here. ? My 21yr old daughter was diagnosed w/RA 4 years ago- she was practically crippled at first- it took us 5 months to get her diagnosed– immediately started her on Methotrexate- then after the ‘insurance required’ 90 days- she was given Enbrel. This combination worked- it seemed to unlock almost all of her joints- with only a few issues. After 2 years she was given Humira instead of Enbrel- after no positive results she was then changed to Orencia. The Orencia works well along with a very strict plant based diet — her inflammation is gone and she has full range of movement, with no pain (has not taken pain pills for over 35 days). Her issue is definitely how nauseated she gets with her weekly dose of 25mg of Methotrexate (she’s been on both pills and the injections)- it pretty much knocks her down for 24-36hrs– looking for ways to alleviate the nausea. I would really appreciate something less toxic for my RA. Have been diagnosed during July 2016 and started meds at the beginning of August 2016. Now I am using 2×2 Methotrexate per week and RA reading decrease from 80 to 7,9 during 11months. The cortisone affect my eyes by dead the left eye neves so that I only have 85% sight. The eye specialist told me that it is just to risky to operate and is not a very successful operation. I try to eat correctly, but it is not easy and have a lot of comments from people. Please let me know if the new meds have been tested well and when it will be released? I also want to know about Altosec? Heard that it causes dementia and I have to drink it every day of my life. Thanks a lot! Prednisone was also prescribed is that a good alternative for methotrexate???? Hi Gloria. Prednisone is not an “alternative” for mtx since they are different classes of meds. But if a person couldn’t take mtx, and the disease is active (pain, disability, and inflammation) then prednisone might be needed. Usually, doctors use it as a “bridge” while trying to find something that does work somewhat – or -waiting for a remission (rare).